Easy WP Hotelier is a powerful WordPress booking plugin allows you to manage your hotel, hostel, bed & breakfast reservations with ease. For free. 3 booking modes available, easily keep track online, multiple rooms per booking and more. Require a deposit at the time of booking or charge the entire stay. It’s up to you. Increase reservations by offering discounts on off-seasons. Maximizing your revenues. Administrators and guests will automatically receive an email as soon as they book a room. Create variable rooms with rates, set units of the same accommodation type and more. An always-improving toolkit for hotel managers that gains new features every month. Extend and enhance the booking plugin features with premium extensions built specifically for Easy WP Hotelier. Supercharge your hotel website! Import your reservations from popular external services including Airbnb and Google Calendar. Enhance the built-in calendar and hide the unavailable dates from the datepicker. An all-in-one booking system with everything you need to manage your hotel online. Why WordPress? Simple, WordPress is the world’s most popular CMS and it powers 27% of the internet. It’s easy to manage and has a massive community of active users and developers. Get Easy WP Hotelier now! Easy WP Hotelier allows you to create two types of rooms: standard or with rates. A room with rates (variable room) lets you define variations of a room where each variation may have a different price, required deposit or conditions. Each room (or rate) can be non cancellable and non refundable, allowing you to charge the guest for the remaining deposit (possible only with some gateways). Three different pricing options are supported out of the box: global price, different price for each day of the week and seasonal prices. You have the possibility to choose between three different booking modes: instant booking, manual booking (requires admin approval) and booking disabled. 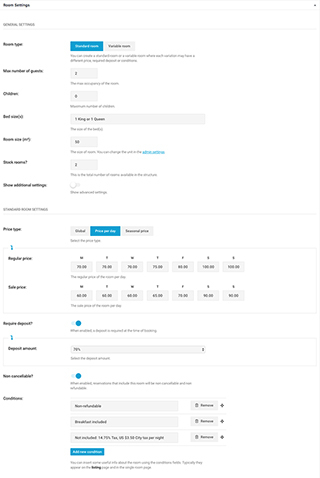 And thanks to an intuitive interface you can easily set your seasonal prices schema, allowing you to increase reservations by offering discounts on off-seasons. With Easy WP Hotelier you can send and receive email notifications when a room is reserved. And a convenient booking calendar for hotel administrators it’s included in the core. Do you have a question about Easy WP Hotelier? See the list below for the most frequently asked questions. If your question is not listed here, please visit the support page or read the documentation. Why use Easy WP Hotelier? Many hotels, B&Bs, and guest houses are building their website with WordPress. It follows naturally that there is a need for a good booking plugin with all the tools you need to manage your bookings, rates, inventory and guests. This is the mission of Easy WP Hotelier: a booking management system, easy to use and perfectly integrated with WordPress. Who should use Easy WP Hotelier? Easy WP Hotelier is the most complete plugin for building hotel websites with WordPress. If you want to create a website for your hotel and manage the reservations directly from WordPress, then you need Easy WP Hotelier. What’s required to use Easy WP Hotelier? Do I need to have coding skills? All you need is a working WordPress installation and you can use Easy WP Hotelier. No coding skills are required. Can I use Easy WP Hotelier on client sites? How much does it cost? Easy WP Hotelier is a WordPress Booking Plugin completely free and open source. So yes, you can use Easy WP Hotelier on client sites without limitation.